Lowsunday are a band from Pittsburgh, PA. I find this odd because most of my extended family lives in Pittsburgh and they all seem unaware that music (post-Beatles) even exists! I always assume that this attitude is universal in the region, but obviously i am mistaken. My relatives must just be clueless. 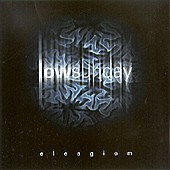 At any rate, Elesgiem was released on Projekt records, home of all things goth and darkwave in America. Home, also, to Floridian shoegazer band Mira, whom i like a lot. Lowsunday remind me more of Mira than they do of, say, Black Tape For A Blue Girl. That is, they are a loud guitar band with only the slightest hint of gothness. They do, however, revel in the 80's, something which i am all for. Lowsunday sound like the last album they listened to, and the one on which they based their sound, is Crocodiles by Echo & The Bunnymen. I never really got into E&tB, but i can recognize a similarity here. Shane Sahene, the vocalist, has a dark but rich voice, and he really pushes it in a way that reminds me of Ian McCulloch. Sahene and co-guitarist Shawn Bann play their guitars loudly but with large doses of chorus and delay to give a rich lush sound. Bassist Bobby Spell plays insistently and somewhat melodically, driving the songs along while still adding fullness to them, and A.T. Vish is capable of drumming in either an understated or a "rawkin out" fashion as the songs require. All of the musicains are talented, and the song writing is pretty good too. The album starts out with the rocking Wallpaper Room, which sounds like a lost track from The Cult's classic Love album. She Follows Rain continues the rock, this time adding some nice echo to the voice for an extra creepy effect. On Zuff they mix it up a little, adding more layers to the sound and the melody and coming up with something that sounds a lot like Modern English. No, not I Melt With You era, but rather their darker earlier work, like Sixteen Days or something off of Mesh And Lace. I really like this track. Somewhat later in the album, Lowsunday turn in the magnificent Shine.... This is their poppiest number. Guitars chime, Sahene bellows, bass thumps, and drums thud all to an undeniable catchy melody. It is their least dark moment, and it really works. There are few moments that clunk a little on the disc. Not too many, but just a few. On Daystar the drums are weighed down by a thick dubby echo that seems totally out of place. In general, this song is a sappy ballad that does not fit in with the rest of the album. The songwriting is unusually weak here. I wonder if Sahene wrote this for his grilfriend or something after she nagged "I'm not in your songs! Why don't you write love songs like Michael Bolton?" Or something like that. Anyway, it really sticks out to me. The only other wierd spot comes at the very end of the disc. Disassembly is moving along nicely, rocking out, and then suddenly in minute 9 of the song, the guitars are lost under a wave of strings. I was sitting on the couch reading when i first listened to the disc, and i had to get up and go to the stereo to see if somehow it had shifted to some classical album i might have had in. But it didn't.... This ending just boggles my mind. Why? Why strings on an otherwise guitar album? If the disc had ended with squealing feedback it would have been more appropriate. Who knows! On the whole, this is a solid disc. If you enjoy the early music by Echo & The Bunnymen, The Cult, or Modern English, then you will enjoy this album. If you like Bethany Curve but wish that they rocked harder, then you'll be pleased. However, if that type of music doesn't do anything for you, then this won't either.